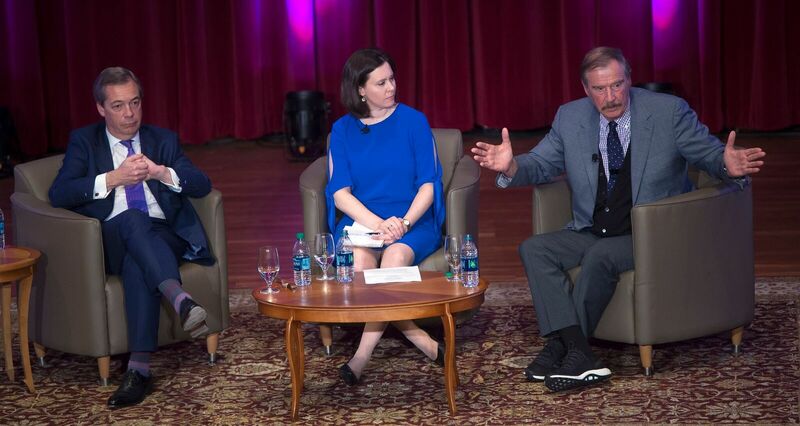 As part of the Lafayette Symposium, Nigel Farage and Vicente Fox debated on April 6 in Colton Chapel on the merits of nationalism versus globalism. (Photo Courtesy of Lafayette Communications). Embarking on its first semester, the three students of the Lafayette Symposium committee said they will be working to ensure that speakers brought by the committee do not hold views that attack the identities of marginalized students. Provost Abu Rizvi, chair of the committee, said that he thinks the committee will be able to represent a wide array of views in its meetings and in its speakers, hopefully fulfilling the symposium’s mission of bringing diverse viewpoints to campus. President Alison Byerly said that she had planned to form the committee since the symposium’s inception at the start of last semester. She chose certain members of the campus community to ask to sit on the committee at the end last semester, after she and her cabinet hosted three events without a committee. The group will be making recommendations to Byerly about what speakers should be brought to campus by the symposium, which is funded by the President’s Office and which hopes to host two events per semester. She said she chose students Princess Adeyinka ’20 and Trisha Agarwal ’20 in part due to the negative reaction on campus to the Farage and Fox debate last semester, and their outspokenness regarding their views. Adeyinka, president of the Association of Black Collegians and committee member, said she was vehemently opposed to the debate between Farage and Fox being hosted by the symposium. Adeyinka said that since Farage demonstrated hateful viewpoints in his rhetoric previously. Even if he did not do so at Lafayette, she argued, it was still problematic that he was given a platform on campus. She added that she will work to ensure that future speakers do not attack the identities of the marginalized. Adeyinka stated that she recognizes the importance of hearing opposing viewpoints to one’s own in an academic setting, but there are some viewpoints that must be recognized as oppressive. “My main focus for being on this committee is to make sure that we don’t bring speakers on this campus under the façade of the presidential symposium, that could potentially harm students on this campus,” she said, adding that she’ll work not to just represent the black population on campus, but students of other marginalized identities as well. President Alison Byerly recognized this concern as a valid one that she had heard last semester, as well. “One of the challenges is that you want, when an issue arises on campus, you want to talk to the students who are most concerned,” she said, “but then the students who are most concerned feel burdened by being asked to help address a problem that they feel they didn’t create. That’s a very reasonable perspective,” and she hopes that having people with a wide array of views on the committee will help get the right people involved in the conversation early enough so that those concerns are alleviated. Agarwal, who also serves on the Equity, Transformation and Accountability Board, was opposed to the debate between Farage and Fox, too, and fears that the aftermath of it may inhibit the Lafayette community’s willingness to be open to the symposium. She said she got “sideways looks” from others when she said she was joining the symposium committee. Rizvi declined to reveal his views on the controversial debate, but said he is excited for the future of the committee. He recognized the administration’s role in supporting marginalized students, but declined to reveal much about the inner workings of the committee as of now. “To the extent that people from different identities feel in need of support, it’s of course the administration’s responsibility to assist in that regard,” he said. He added that the wide array of views on the committee provides for “views of all kinds [to] be represented” and that the “process” of committee deliberations is working well. In their last meeting, he said, the committee divided up into multiple small groups to discuss the “several dozen” suggestions of themes and speakers obtained from the digital survey of campus, and they will reconvene and discuss more in the next meeting. Rizvi declined to comment on any discussions held in the committee, who was on his small group within the committee and what his small group, or any of the small groups, discussed. “I don’t think it’s appropriate to talk about that kind of thing. I think it’s important for the committee to deliberate,” he said. Adeyinka and Agarwal discussed one theme brought up in the first meeting, which was the idea of innovation versus maintenance. Agarwal spoke about how that can apply to many different fields, including her own of STEM. Adeyinka emphasized how that kind of topic can be spoken about and debated without attacking anyone’s core identity. Government and law professor Ilan Peleg, one of four faculty members on the committee, said that the group will aim to create an “intellectual environment” on campus. He, too, declined to comment on the debate between Farage and Fox. As for the last symposium event hosting Farage and Fox, he said, “I don’t want to put myself in the middle of this particular debate” by revealing his viewpoints on it. The other three faculty members on the committee are biology professor Robert Kurt, English professor Ian Smith and engineering professor Mary Roth. Four administrators, including Vice President of Campus Life Annette Diorio, serve on the committee. The third student serving on the committee is student government president Connor Burwell ’19, who said he will try to serve as a voice for all student perspectives, including marginalized ones. “I feel confident that the symposium will not be another Mill Series,” he added. The Mill Series is another viewpoint diversity initiative on campus which was restructured this semester. Formerly, it aimed to bring conservative speakers to campus, as founders government and law professor Brandon Van Dyck and Abdul Manan ’18 held that conservative viewpoints were underrepresented in academia. However, this semester, a student committee will aim to focus on all viewpoints and can choose the Mill Series’ speakers and events, and can veto any speaker Van Dyck wishes to bring. He and Manan previously chose speakers themselves. It is a charity funded by donations, solicited on their website. Adeyinka said she personally tries to distance herself from the Mill Series, as her experiences with its speakers such as Roaming Millennial have not proven to be intellectually valuable. She said it remains to be seen if the symposium offers a forum of intellectual dialogue. “I’m a part of the committee, but I’m not going to hype up the symposium,” she said, “in the sense that I have to wait and see what we actually do before I put my full support behind it if that makes sense. Being a part of the committee is to make sure that the symposium doesn’t repeat what happened last semester [with the debate], and to make sure that it’s actually a platform where we actually have diverse and academic discourse or debates. “So I think…just wait and see what the symposium does,” she added.